It’s hard to remember a time before Facebook existed, but it was just over 20 years ago when the site was first launched. Since then, it’s grown into its own entity, even developing its own lexicon of ‘likes’ and ‘pokes.’ The saying ‘Facebook me’ has now all but replaced the traditional ‘Call me’, and even the more recent ‘Text me.’ And through all of this, it has morphed and grown into what it is today. Facebook today has become a powerful social media marketing tool, particularly in the area of video marketing. Over 100 million hours of video are watched each and every single day on Facebook. It’s for this reason that you’ve got to make the most of your video marketing opportunity on Facebook, and avoid these common mistakes at all cost. You may have other great content, or you may just prefer not to make videos, but you just can’t push videos aside as if they aren’t the most important weapon you’ve got in your arsenal. Videos on Facebook get 135% greater reach than photos on Facebook – they’re shared more often and more easily consumable than is a long text article. In short, if you haven’t already started using video marketing on Facebook, get started right away. 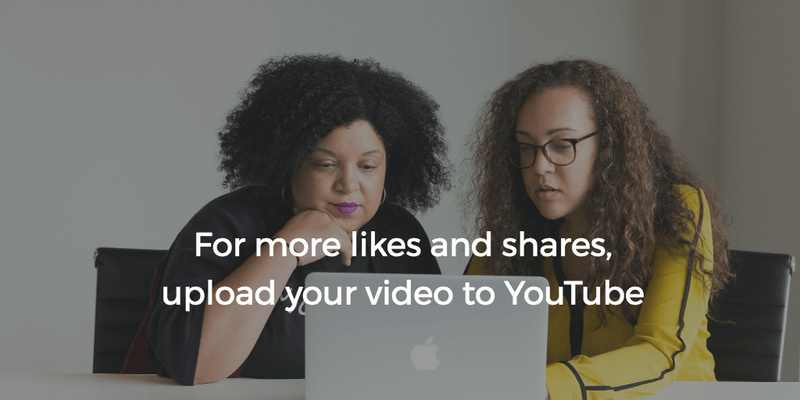 Rather than uploading your videos to the YouTube platform, Facebook prefers you to directly load your video content right into their platform, allowing their algorithm to more easily get it in front of your audience. Bringing your videos straight to Facebook almost guarantees you’ll get more shares, likes and comments. Facebook does allow for a 45-minute limit on video content, but that does not mean you need to create videos that are anywhere near that long. How Lond Should Your Video Be for Each Social Platform? “It’s been shown that videos under two minutes perform the best and have optimal engagement. They’re short and to the point, and you’re able to get the message across before the viewer loses interest”, – says Carol Wise, a video content manager at Boomessays. Bonus tip: If you are looking for some examples of great Facebook videos, make sure to check Ellen DeGeneres Facebook page. She posts fantastic short videos that are about 5 min each on general. When it comes to creating different types of videos for Facebook marketing, you’re only limited by your creativity. No matter what product or service you’re offering, there are a number of different styles of videos you can shoot, from how-to’s to behind the scenes. Consider, for example, a fast food restaurant showing a behind the scenes of how their French fries go from a potato in the ground to the fry on your plate. This behind-the-scenes video made by McDonald’s Canada got over 11 million views on YouTube alone. Not only did it help McDonald’s get more exposure but also openly show their customers how their food is made, which builds trust and promotes the brand in the long run. If you’re working on a tight budget, don’t fret. Hi-res videos can easily be created by simply using the Smartphone you’ve probably already got on hand. And you won’t need a production crew to help you put together your video. Inexpensive tripods are the perfect alternative to trying to find someone to hold that camera steady for you. Just don’t underestimate the importance of your audio, so if your phone or camera isn’t producing great audio in your videos, you’ll want to invest in a good microphone. Another option would be to go with a video maker like Wave that also allows you to create videos easily and on budget. If you really want to boost the reach of your videos, consider paying for promoting your videos through Facebook. Facebook gives you an amazing opportunity to see and track the results your content is getting, to let you know what’s been working, what could use some improvement, and what should be ditched altogether. Don’t ignore this wonderful gift of analytics they are offering to you. Make sure your hard work is noticed, but don’t work harder than you need to. Anna Beker, a Video Production Assistant at Ukwritings comments: “If you’re making and posting an endless number of videos, but not seeing results in the form of new customers, take a look at what the analytics are telling you. If it isn’t an issue with the amount of content you’re providing, it’s likely an issue with the content itself”. Use the awesome power of Facebook video marketing to your advantage by avoiding these common errors and making the most of the social media monster. In doing this, you can claim a share of those 100 million hours of video watched on Facebook per day as your own. Gloria Kopp is a digital marketer and an elearning consultant from Manville city. Now she works as a content manager at Essayroo company. Besides, she is a regular contributor to such websites as Engadget, Huffingtonpost, Academized etc. Read her Studydemic posts.